Spray 10-inch ovenproof nonstick saute pan with cooking spray; heat over medium-high heat. Add onion; cook and stir 3 minutes or until onion is tender. Add spinach and garlic; cook 2 to 3 minutes or until spinach wilts. Stir in drained tomatoes, vinegar and pepper. 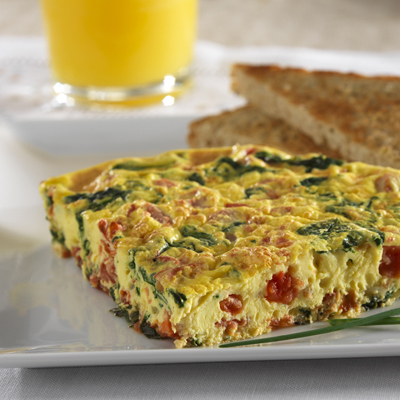 To cook frittata completely on stove-top, pour Egg Beaters over spinach mixture; reduce heat to medium-low. Cover skillet. After 6 minutes, lift edge of frittata with spatula and tilt skillet to allow Egg Beaters to flow underneath in several places. Cover; continue cooking 4 minutes or until set.